“Kenroku-en” garden in Kanazawa City is renowned across Japan as one of the three greatest Japanese gardens together with “Koraku-en” and “Kairaku-en”. “Kenroku-en”, a style of Japanese garden with a path around a central pond, is derived from an old garden annexed to Kanazawa Castle built by “Kaga-han” fief in the 17th century. Repeated improvements had been added on it by the successive feudal lords to complete today’s aspect and its name “Kenroku-en” was fixed early in the 19th century. The selling points of this garden are an excellent view with gentle rise and fall and beautiful snow scenes in winter. 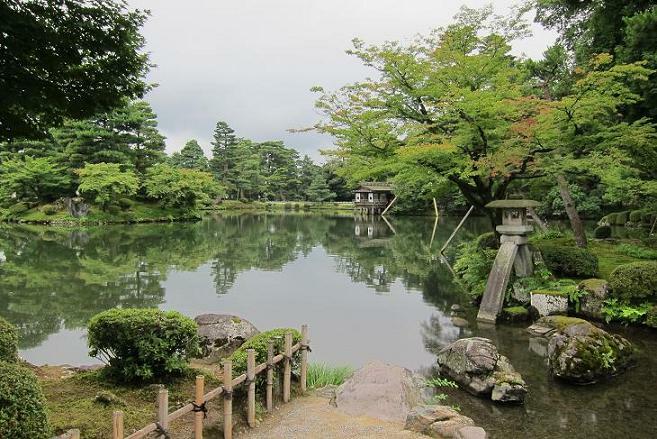 The picture shows “Kasumi-ga-ike” pond located at the top of the garden, that is the main attraction of this garden. In this connection, the name of “Kanazawa” which literally means a golden stream stems from a stream “Kinjo-reitaku” divine stream of gold in this garden. This garden had long been exclusive for the “Maeda” family as its private garden, however it has been opened to the public since 1874.